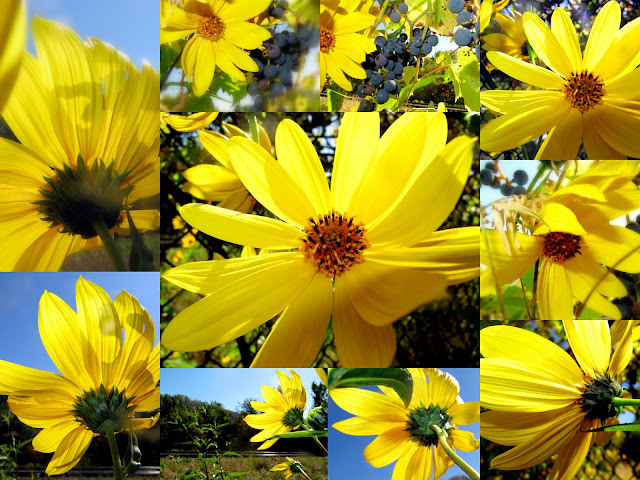 These are photographs taken of wildflowers growing beside a bicycle path and railway track not too far from our home. For those of you caught in the big snowstorm this weekend, I thought they might be a cheery reminder of summer and sunshine. Hope you all stay safe and warm! Gorgeous! Such vibrant colors :) Blue and yellow are two of my favorite colors and totally remind me of summer. Thanks for the bit of sunshine in the midst of my white surroundings. My heart goes out to those on the East Coast as they are truly experiencing a big winter storm... we are expecting 6-10 inches which pales by comparison for once. I'm just stuck in winter, not the huge storm on the east coast. I enjoy the bright cheeriness of the flowers regardless. I hope you don't get too much snow, sounds like a doozy. winter is supposed to come back next week here too. I doubt though, that we'll get feet of snow. We heard about the heavy snowfalls over your side on the news. very nice. like a ray of sunshine...all that color. Oh yes I can use all the warmth they are sending. Have a lovely winter day.. I'm wearing a yellow tshirt today the colour of your sunflowers. They bring us cheer. Thanks Bonnie.